The rhythm of snow fences set in place in the open fields along the roadway. That’s all. That’s it. I must have sensed the poetry in the wavy line of snow fences then for the first time, more than forty years ago. How they suddenly appeared to me. What they might have suggested as I drove by in the countryside, taking in my new natural world. I had never known or seen a snow fence before. I was reminded of this again the other day, a very unnatural warm day in December, still no snow on the ground, as I saw workers unrolling, unfurling, stretching them out across an open, barren winter landscape. Pounding them into the earth in a somewhat straight line. I recalled that I had once written something about snow fences in one of my books. And I always wanted to say some more…this pre-winter warning, this ritual in the rural. There was a reason for that short entry, coming to the end of the journal I had been diligently keeping for a year…the discipline I forced upon myself: Put something down about the natural world, some observation, thought, memory, description every single day! I was tired of the task by the time I reached December…worn out … determined never to practice such a discipline again…my entries honed down to almost haiku “ah, ahs” at this point, my eyes sharply focused on holding just one thing in the fewest words possible, compared to the paragraphs I had begun with, worked with day after day, month after month when my world seemed more crowded and expansive. And now, at first, I see? Just a roll of weather-beaten natural wood slats, a fence about 4 feet high, 50 foot lengths? held together by 4 or 5 strands of wire and meant to stand tall with metal stakes. A roll of practicality, unrolled just before winter, with a mission to minimize snowdrifts upon the highway, make the world safe for drivers. But that’s too much factual information. That’s not what snow fences are all about. Where’s the poetry of their faded red, weather-beaten color against the whitest winter snow? The rhythm of them as they wind this way and that way in winter? The long shadows they cast in a late winter afternoon? The humor in them? The sadness, standing there all night in the dark? The stark beauty on a moonlit night? And how, if you drive slowly down a road in a blizzard, sense their presence in a field beside you, gently open the car window and listen…sometimes they sing. f: Put something down about the natural world, some observation, thought, memory, description every single day! I was tired of the task by the time I reached December…worn out … determined never to practice such a discipline again. I’D BE WORN OUT LONG BEFORE YOU. Thanks for the beautiful touch of the Door…for your ability to find words that awaken all of us to the beauty and wonder of the ordinary world that surrounds us. 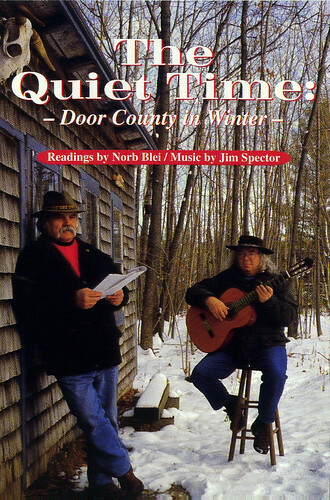 Love the picture and your words, Norb. Never knew they were originally red. I’ll look again. Thanks Norb. Beautiful picture. Though valiant, broken and battered. Man’s puny rebuff to nature. Reminds me of why I love black and white films which use the patterns of venetian blinds frequently. Simplicity with overtones. I opened my Door Steps and put a copy of your writing on page 151. Finding poetry in snow fences is something I haven’t thought about before. I like the way they have been blown about, every which way, and are still standing-kind of like us as we journey toward nirvana. Finding poetry in a snow fence makes me believe one could find poetry in anything. 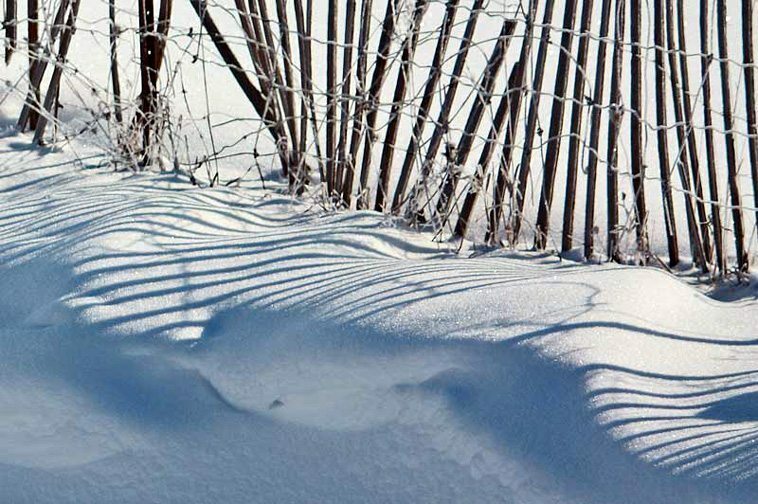 The snow fences remind me of us: blown by storms in many directions but still marching toward nirvana or spring. … this is pure haiku. …ahhh the brilliance of diamond ice as we wave goodbye to the third season. Beautiful.